I'm excited to announce that I'll be writing several monthly features for the She Knows Book Lounge. One of my regular columns is an audiobook round-up. This month I feature a thriller starring a strong female protagonist; a fun contemporary novel that involves a widow, five bachelors, and food; a historical romance; a novel about facing a parent's worst nightmare; and a heartwarming story of small-town life on the Colorado plains. Click on through to see my debut "Audiobook Round-Up" article. I'm off to check it out. You always have so much productivity going on in your blogging life, while I persist in being a blog sloth. Congrats! I will definitely check it out. This is a great opportunity. Congrats. How exciting!!! I have to see your article! Sounds like you are branching out. Good luck with your new columns. I'm going to have to check them out when I have time. I'm looking forward to reading your audiobook roundups. 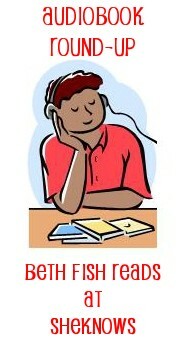 I've become a huge fan of audiobooks now that I got the hang of them. Very cool! I am starting to feel the audiobook love as well, and am getting to a lot of titles that I am enjoying at the moment!